Part of a series of deals marking Wacom's 35th anniversary. 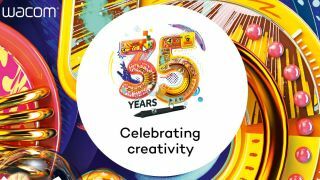 Wacom is celebrating its 35th birthday, and offering some amazing deals to mark the occasion. We've already seen the price of the MobileStudio Pro dropping by up to £300, and now Wacom is also lowering the price of its Cintiq Pro 13 by £200. The smallest graphics tablet in the Cintiq Pro range has been reduced to £799.95 from £999.95 (or €859,90 down from €1099.90). Wacom rarely runs deals, so it's worth making the most of this price drop. For more bargains, check out our article on the best cheap Wacom tablet deals. We awarded the Cintiq Pro four and a half stars in our review, and were especially impressed by how Wacom had managed to make the drawing experience feel more natural, and by the quality of the screen. Read our Cintiq Pro review here. Wacom has long ruled the roost when it comes to graphics tablets, but if you're not sure which device is right for you, take a look at our guide to the best drawing tablets in 2018. The price cut comes as part of a series of sales and price drops being rolled out over the next few months as part of Wacom's 35th anniversary celebrations. The company launched in Japan in 1983 with the aim of finding better ways to connect humans with their computers (the name comes from the Japanese syllable ‘Wa’ for harmony and ‘Com’ for computer). It worked to develop an intuitive input device for the more creative uses of a computer, and the result was the digital pen tablet.